A 23-year-old Oklahoma man used a semi-automatic AR-15 rifle to shoot and kill three masked teenage intruders dressed in black who broke into his home Monday afternoon — an act authorities are investigating as self-defense. Zach Peters, the homeowner's son, fatally shot an 18-year-old man and two boys ranging between 16 and 17 around 12:30 p.m. The trio allegedly forced their way into the residence through a back door and were killed after exchanging words with Peters, who fired multiple shots. Police said the alleged getaway driver, 21-year-old Elizabeth Rodriguez, surrendered to the Broken Arrow Police Department Monday evening and is facing charges on three counts of first-degree murder and three counts of burglary. Her first court appearance, set for Tuesday, has been pushed to April 5 and she was ordered to be held on no bond. 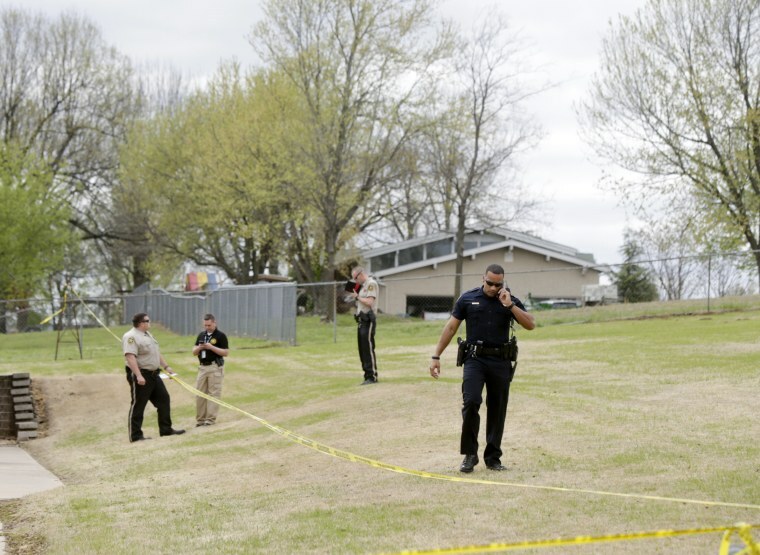 "Upon making entry to the home, one of the residents fired a rifle striking all three of the suspects," the Wagoner County Sheriff's Office said in a statement. Wagoner County Deputy Sheriff Nick Mahoney said that Rodriguez is being charged with the murders because she was in "commission of felony" when she allegedly dropped them off at the residence, meaning she had an intent to burglarize the home. He said the crime was random and there was no connection between the suspects and Peters. Police said all of the unidentified suspects were wearing black clothes, masks and gloves. One was armed with a knife and another with brass knuckles. Two of the intruders died in the kitchen, while the other reached the driveway, "before succumbing to his injuries," according to the statement. After the shooting, police said the son and homeowner made statements at the sheriff's office. Although authorities are approaching the shooting as self-defense, Mahoney said the investigation is open and the district attorney will ultimately decide whether charges are filed. Similar to 22 other states, Oklahoma has passed stand-your-ground legislation which justifies a person using deadly force in order to protect themselves under certain circumstances. Oklahoma's law states that a person who is attacked in their home "has the right to stand his or her ground and meet force with force, including deadly force, if he or she reasonably believes it is necessary to do so to prevent death or great bodily harm to himself or herself or another or to prevent the commission of a forcible felony." "They are looking at it as self-defense but they are also looking at any other possible way that it could be looked at," Mahoney said. During a press conference, First Assistant District Attorney Jack Thorp called the case "complex" and said a Medical Examiner is working to identify the bodies of the three teens. Charges will likely be filed against Rodriguez next week. A probable cause affidavit was presented to the court, allowing Rodriguez to be held without charges past 48 hours, officials said. Thorp told NBC News that Rodriguez does not yet have a lawyer. “This is a triple homicide. We want to make sure we cross all our t’s and dot our i’s. We need the maximum amount of information before filing charges… Hopefully, as we go forward, we’ll see whether the facts meet the law," Thorp said during the press conference. The AR-15 was the weapon used in mass shootings such as Newtown, the Aurora movie theater in Colorado and San Bernardino. Bloodshed like this is rare in the area, Mahoney told NBC-affiliate KJRH. Broken Arrow, with a population of 103,500 people, is the largest suburb of Tulsa and is located about 15 miles east of the city. "This isn't something that happens frequently here," Mahoney told NBC-affiliate KJRH. "We don't generally have triple shootings inside Wagoner County. It's a very nice neighborhood...the neighbors have all been concerned...it's not something that happens."